With 70% of my RadioShack thesis playing out sooner than I expected, it’s already time to seriously re-evaluate my position. So I thought that visiting one of the new concept stores would be a great place to start. Luckily, there’s one that opened-up in downtown Boston a few months ago. Sandwiched between a bank and a bakery along the Freedom Trail, the Boston concept store has a considerable amount of foot traffic passing by everyday. Sounds like a prefect location! 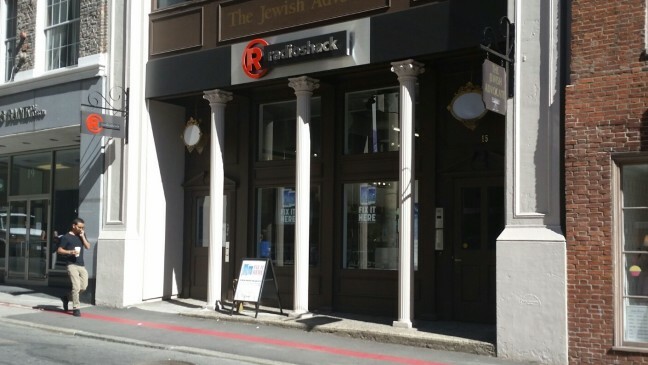 Unfortunately, due to the the historic status of the area, RadioShack isn’t allowed to do much with the outside of the building. This results in smaller than desired windows and a decreased visual allure. The store doesn’t have much of a chance to actively entice curious pedestrians who weren’t already planning on stopping by. The best this location can do is leave the door open and hope that the music draws people inside. Once you step inside, though, it’s an entirely different experience. 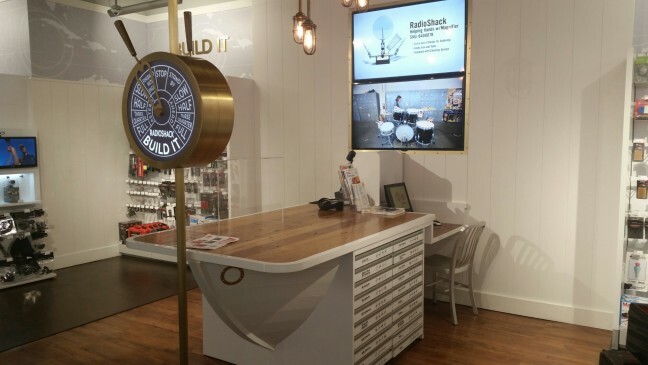 The Boston concept store looks nothing like the RadioShack everybody is familiar with. 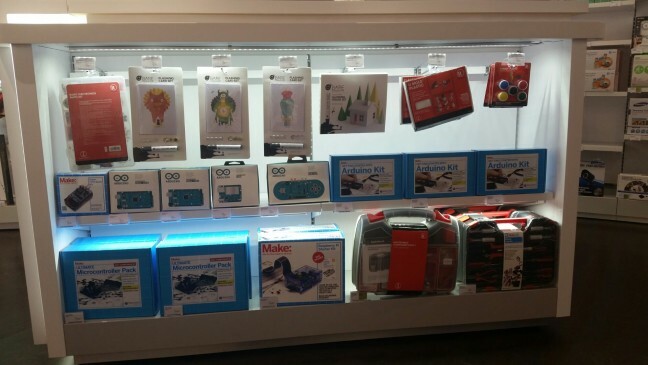 This store is all about playing with electronics! The old stores were solely about stepping in and buying what you already knew you needed, exactly like a convenience store. The new place is still an electronics convenience store, but now puts a bigger focus on coming in and trying things out. . . maybe finding something you never thought you needed. Will it result in increased sales, though? That’s still debatable. After visiting the concept store, I have no doubt in my mind that I’ll return to this location in the future, especially if I need to buy one of three things: a new cell phone, new headphones, or new portable speakers. 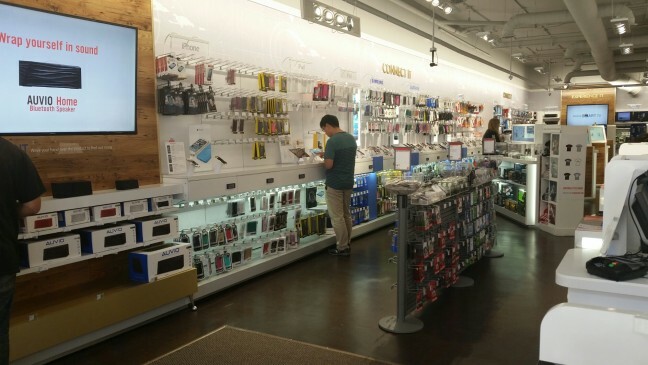 The concept store has working versions of nearly every carrier’s newest cell phones and tablets available to test drive, not just the plastic dummies you find in most other stores (including the older RadioShack locations). Once finished looking at the cell phones, you can also try on a variety of headphones to compare sound quality and feel. Finally, there’s a speaker wall where you can audibly compare portable speakers, helping you find the brand that fits your needs. 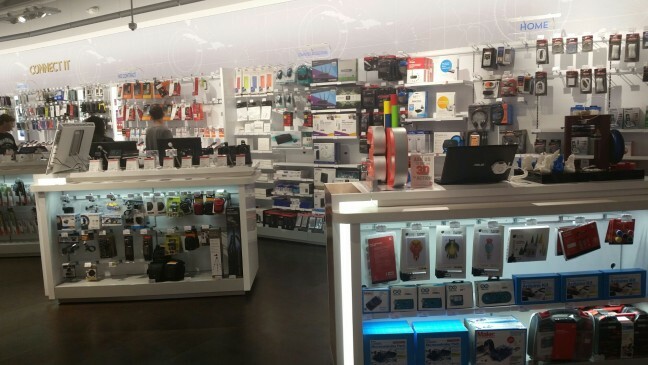 Even with all of the cosmetic changes, RadioShack is still an electronics convenience store at its core. The Boston concept store’s hours span from 7:30am to 9:30pm. . . convenience store hours, not Best Buy-type hours. Furthermore, there are three locations within a few blocks of each other in downtown Boston, just like any convenience store. And in general, if you google your nearest electronics store, it’ll likely be a RadioShack. 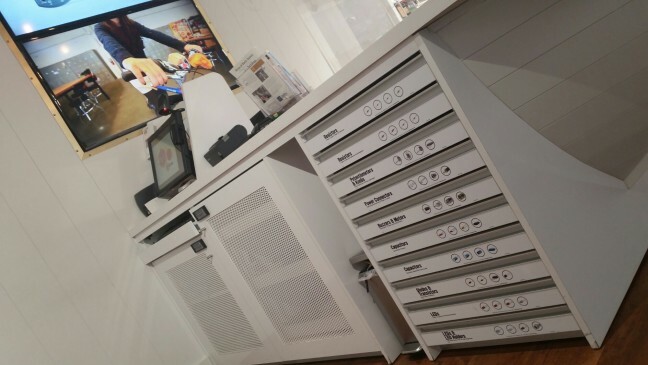 Looking at all the pictures, it’s obvious that the concept store still carries a wide array of electronics convenience items for the average consumer. These items include chargers, cables, batteries, cameras, portable hard drives, keyboards, mice, video game controllers and headsets, CDs, DVDs, Blu-rays, and even VHS tapes (I like to refer to this genre of things as “in-a-pinch electronics”). They also still carry convenience items for tinkerers, such as resistors, capacitors, connectors, motors, buzzers, potentiometers, basic ICs, diodes, breadboards, Arduinos, soldering irons, solder, and flux. And this just names a few of their in-stock items. RadioShack has always been my savior whenever I’ve needed any electric-circuit-related item at the last minute. This was especially true when I was an electrical engineering student at Boston University. What about now, though? They will no-doubt continue to come through in clutch situations, even with the redesigned stores. I’m amazed by the number of cracked screens I see while riding the Boston subway everyday. That’s why I have a good feeling that RadioShack’s “Fix It Here” program will likely become ridiculously popular. And that’s also why I wasn’t surprised when within my first five minutes inside the store, some lady came in to drop-off her phone with the “Fix It Here” guy. I can honestly say that, personally, I feel a lot less nervous about dropping my phone now that I know a RadioShack nearby can fix it within a few hours. A 3D-printer sits on a table near the middle of the store, always working on a new project. The controlling laptop is out in the open, allowing you to upload personal files if you come in at the right time. 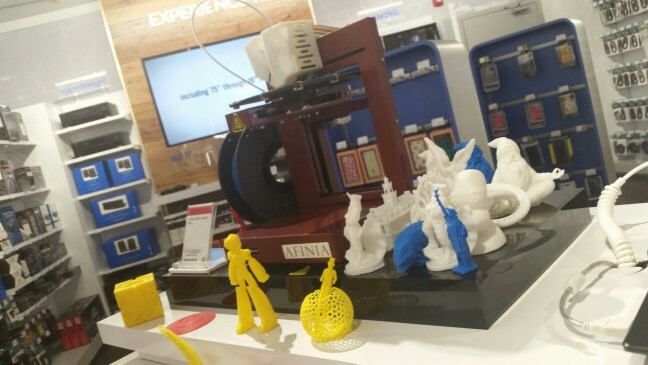 And if you’re interested in buying your own, they sell both 3-D printers and the refill spools. 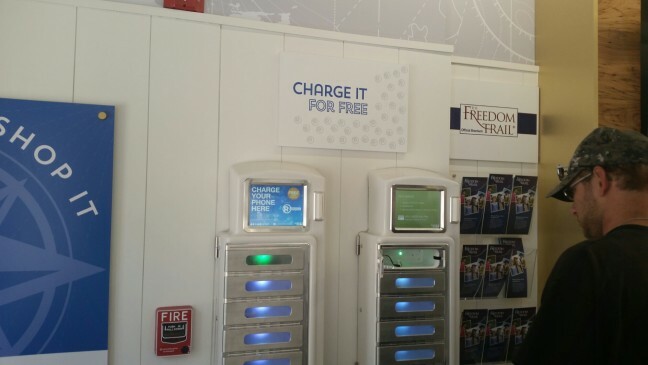 If you need to charge your phone and don’t want to spend a dime to claim a table at Starbucks, RadioShack has a “Charge It for Free” center. 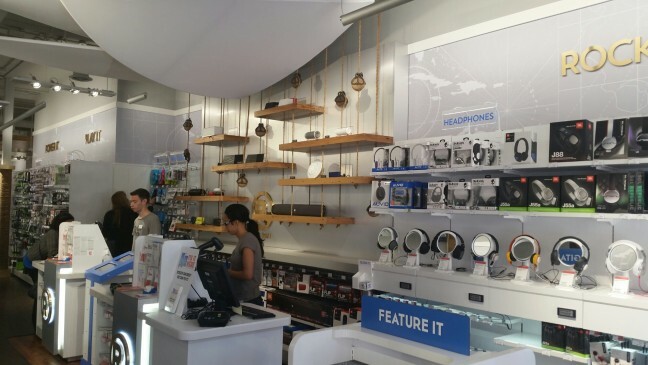 This is a nice, simple addition to the store and another way that RadioShack comes through in a pinch. As you can see in the picture below, somebody was utilizing the station. And here’s an extra feature that’s small, but it surprised me quite a bit. 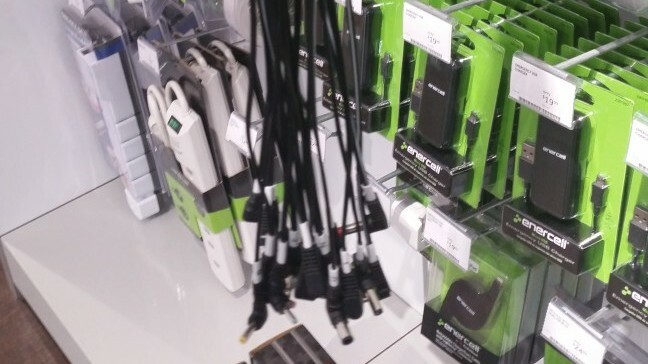 RadioShack made a tree of charger connectors to help people figure out which charger plug fits into their device’s socket. This shows a nice attention to detail that’s ingenious and appreciated. Just one more example of how RadioShack continues to do a tremendous job of answering people’s questions through hands-on experiences. As an investor, I noticed all of the well-priced RadioShack-branded products. But I also looked around the store for familiar name-brand items, and I was happy to see competitive pricing on a lot of those items. Actually, let me rephrase that a bit. . . I was downright surprised. I scanned a few devices with my Amazon app (such as hard drives, keyboards, and network devices) and only found Amazon cheaper by a couple of bucks. As for big-ticket items like the GoPro HERO 3+, RadioShack carries the exact same price as Amazon. This list shows a sizable increase compared to my days visiting the old RadioShack. From the above list, all I would ever buy from the old RadioShack were circuit board components and in-a-pinch electronics. What about the average consumer (the people who aren’t invested in the company)? How do I think they view the new stores? I see one major problem with the Boston concept location. . . nobody knows what to expect from it. Until I walked in, I didn’t know what the new store offered, and I imagine others feel the same way. 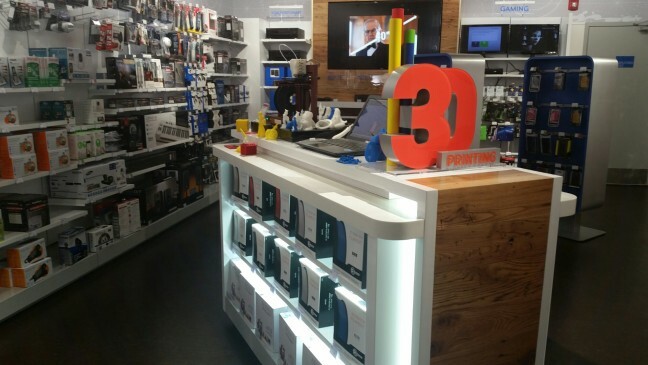 New customers might not feel like they have a reason to step inside, while old-time customers might assume that the new RadioShack stores don’t offer all the same products as before. For example, I talked to a friend after I visited the Boston concept store. He told me (with conviction) that it’s sad how the new stores don’t offer circuit board components anymore. Once I told him that they do, in fact, offer all the same circuit-board components (in addition to a whole lot more), he admitted that he hadn’t actually walked into the new store. I know this is just one person and one example, but I assume many others feel the same way. 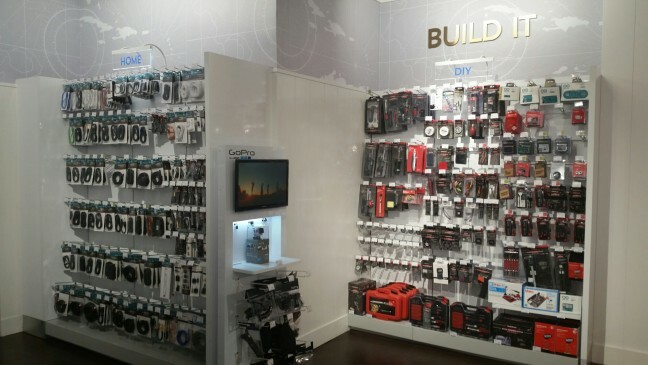 Without more focused advertising, both new and old customers won’t know what to expect from the new RadioShack. As an investor, this means there’s still huge potential waiting for proper execution. Overall, I’m ridiculously excited about the new RadioShack. Combined with the fledgling “Fix It Here” program, the recently-announced Defense Mobile contract, and the future RadioShack Labs, there’s a tremendous amount of potential within the new stores. With untapped potential, though, comes the risk that nobody ever notices it. However, I’m willing to take that risk, which is why I will maintain my current RadioShack investment. Thanks for your information on Radioshack. I think the chances of CONN’s bankruptcy are much higher than RSH at this time. I wished I bought some puts on CONN last Friday. I think people are assuming that Radioshack has no chance here. I happened to visit a store in a local mall which was not upgraded to the new looks yet, 2 weeks ago, during the back to school shopping weekend. There was one or two customers dropping in and out. I was only there for a few minutes and felt nice about being in the store. I did not ask the support folks there about how busy they are. The standard answer would be they were doing great, from my experience in the past with Circuit City. But, I felt they seemed confident and happy. I am yet to visit another local store. 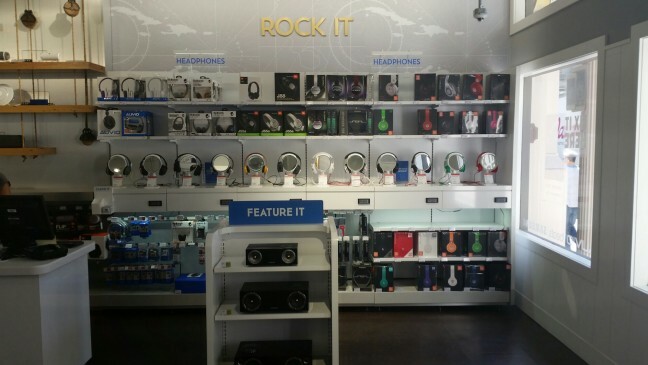 I hope Radioshack survives with new looks and becomes a strong competitor to Best Buy. Please see corrections to my couple of sentences. There was one or two customers should read There were.